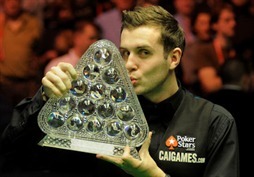 Mark Selby (England) won the 2010 Pokerstars Masters. England's defending champion Ronnie O'Sullivan was just one frame away from his fifth win after taking a commanding 9-6 lead but Selby stormed back to take the title 10-9. Selby received £150,000 for the victory and O'Sullivan got £75,000 for his runner-up spot. Mark J Williams (Wales) and Stephen Maguire (Scotland) lost out in the semifinals. Maguire and Neil Robertson (Australia) tied for the highest breaks of the tournament with 140 to share the £10,000 prize.. This was the second Masters title for Selby. He also won on his 2008 debut. Last year he lost in the final to O'Sullivan. The event took place at the Wembley Arena, London, England 10-17 January, 2010. Next up on the snooker calendar is the Totesport.com Welsh Open which starts 25 January 2010.